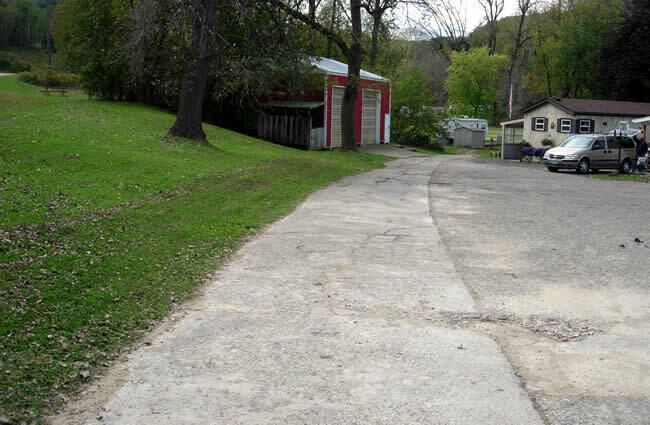 A piece of one of Minnesota's first paved highways survives today as a lowly driveway for a trailer park near the Pla Mor Campground southeast of Winona. 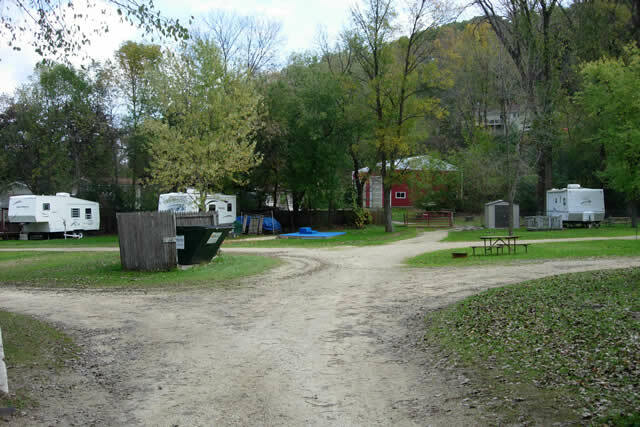 A portion of the campground's driveway may have also been constructed on the old highway's alignment. An 8 foot concrete road was constructed along U.S. 61 between Winona and La Moille in 1913/14 as one of three constructed in the Winona area, the other two being along the future alignments of U.S. 14 and State Highway 43. The road was graded to twenty feet wide, with 8 feet of concrete pavement in the middle, and 6 feet of gravel shoulder on each side. Construction was funded under the provisions of the Elwell Highway Act of 1910, which created a funding scheme that split the cost of highway construction between the state, counties, and local authorities. Roads built under this act were known as "State Roads", a designation that would persist until the trunk highway system was created by the Babcock amendment in 1920. The construction of the road was marred by difficulties. The original contractor, Carlton and Prinz of Minneapolis, forfeited their construction contract when they were not able to complete the roads by the end of 1913, citing labor difficulties. The paving was completed by the firm of Hanlon and Oakes in 1914. By the time U.S. 61 was routed onto Highway 3 in 1926, the 8-foot pavement's days were numbered. A contract had been let by the Department of Highways to replace the old road with a more modern grade and pavement. The November 20th, 1926 edition of the Minnesota Highway News announced the beginning of grading work to replace what they called "Minnesota's first concrete highway". The press release also stated that the concrete was still in decent shape despite the primitive techniques used to construct it. However, traffic had increased too much to let the old road remain in use. The new grade was completed in 1927. This section was bypassed in order to straighten the road. Information for the above history was primarily taken from articles in the Winona Republican Herald, accessible online courtesy of Winona State University. 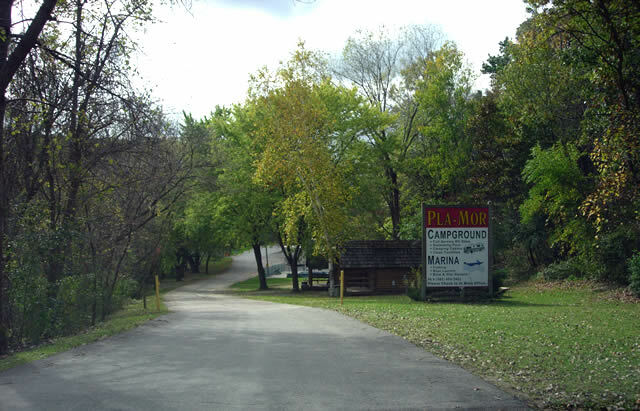 This segment is accessible from Woodland Hills Drive, the first turn-off south of the entrance to the Pla Mor Campground. A small piece of the original concrete pavement survives at a trailer park just south of the modern highway. The pavement disappears at the gate to the camp ground. 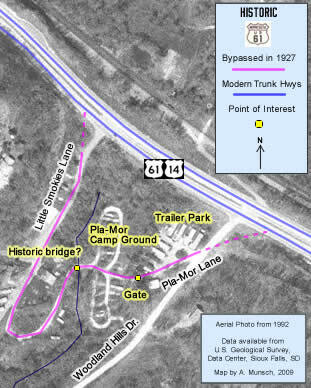 From visiting the site, it appears probable that the old road followed the current camp driveway. However, I can not be 100% sure of this. Looking southwest down Pla-Mor Lane, part of which is still uses the old highway for pavement. A friendly local resident confirmed that this was indeed part of the old road. 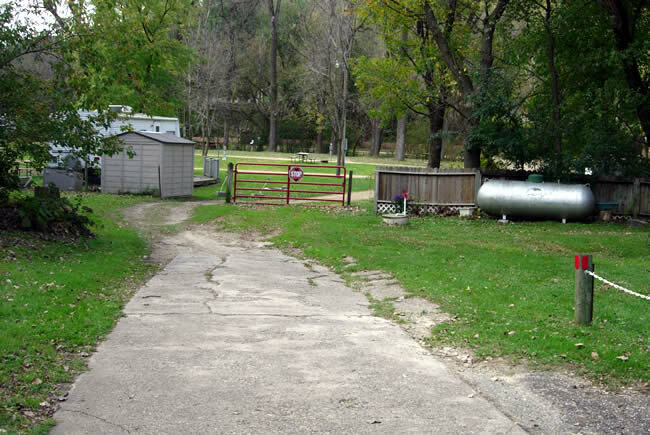 The old pavement disappears at the gate to the Pla-Mor campground. Looking back towards the gate from the middle of the camp ground. Looking west in the camp ground. 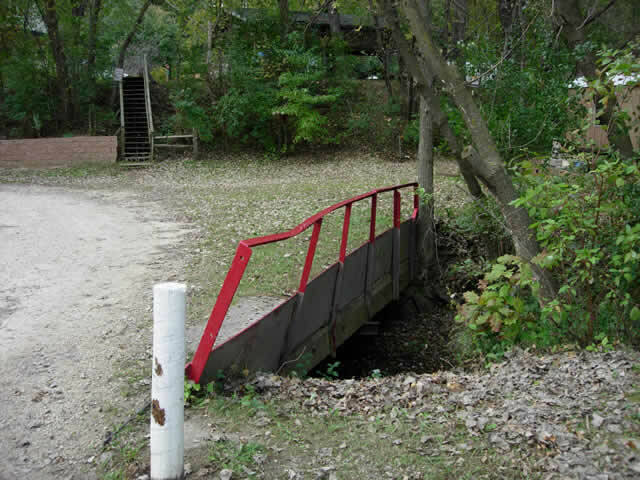 Could this be the old bridge over the creek? Looking south down Little Smokies Lane into the Pla Mor Campground.